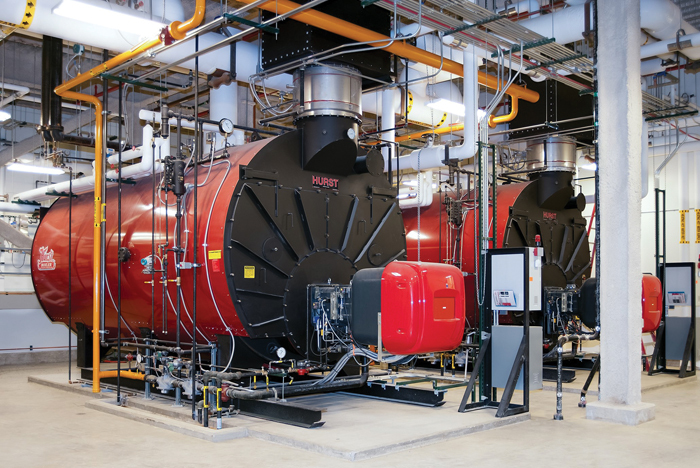 A boiler system is a crucial piece to maintaining reliable steam-powered operations. Repairs can be costly and decrease productivity, therefore avoiding issues and taking proactive measures to keep the system in working order is well worth the time and money. Of particular importance is investing in high-quality Deaerator systems, which work to make the incoming water safe to move on into the boiler. In order to create steam, your boiler requires water. Though most water looks clean and pure to the naked eye, gases and oxygen are present that may be harmless to us while causing incredible damage to the inside of the boiler. These naturally occurring gases in the water like to cling to metal, resulting in oxidization and corrosion. To remove these elements before they create a problem, water in the feed tank must go through the deaerator. There are different types of deaerators, but their primary function and process is the same. Once the water is fed into the system, it is heated up to a high enough temperature that gases such as carbon dioxide and oxygen are released. To eliminate the rest of the gases, the water is then scrubbed by oxygen-free steam and then broken down into microscopic droplets as it continues on its path to the boiler. Preventing harmful agents from entering the boiler is a major factor in utilizing a deaerator and plays a huge role in keeping your equipment healthy. The deaeration process also provides additional benefits that keep performance running at optimal levels, making it a key investment for your entire system. By providing the boiler water that is ready to use, your equipment can work efficiently and smoothly, keeping operating costs and energy usage down. It can be tempting to overlook items that add extra cost and set-up at the beginning stages of a project but try to look at the big picture and concentrate on avoiding unnecessary expenses down the road.